The 2016 Series Futsal Australia Cup has been deemed a huge success after record crowds, online viewers and website visitors broke all of the competition’s records. Held for the first time outside of Victoria, the 2016 SFA Cup was played at the WA State Futsal Centre in Perth, where 1000s of patrons packed the stadium to witness some of the best and most intense futsal ever seen in Australia. The crowd – and the huge online audience – tuned in to see West Australian side Claremont Cambio Cumbre defeat local rivals Stirling FC in a match decided after a penalty shootout. It was Cambio Cumbre’s third-successive victory in the SFA Cup. More than 2500 people watch the action unfold live via the Futsal Oz YouTube page, with the final day of action now watched almost 7000 times. CLICK HERE to watch the ‘as live’ action. And to top it off, the Series Futsal website reached a new record for the amount of unique viewers visiting the site, with close to 2000 unique views coming to the site. 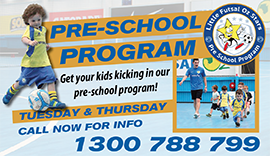 The Series Futsal Australia Cup is part of the ‘Series Futsal’ franchise, in partnership with Futsal Oz and its state-based associates. WA State Futsal Centre manager El Abrahams said that he was blown away by the reaction to the SFA Cup in Perth. “We were more than happy to host SFA and I think it exceeded all of our expectations,” Abrahams told SeriesFutsal.com. “It’s something we’ve had our hearts set on for a while now and, most importantly, it was something special for all our devoted futsal fans in WA, players, parents and the local community in general. The next Series Futsal Australia Cup will be held at the Thomastown Futsal Oz Stadium, north of Melbourne in April next year. CLICK HERE for more details on the future of the Cup. CLICK HERE for image galleries and news on the Series Futsal Australia Facebook page.